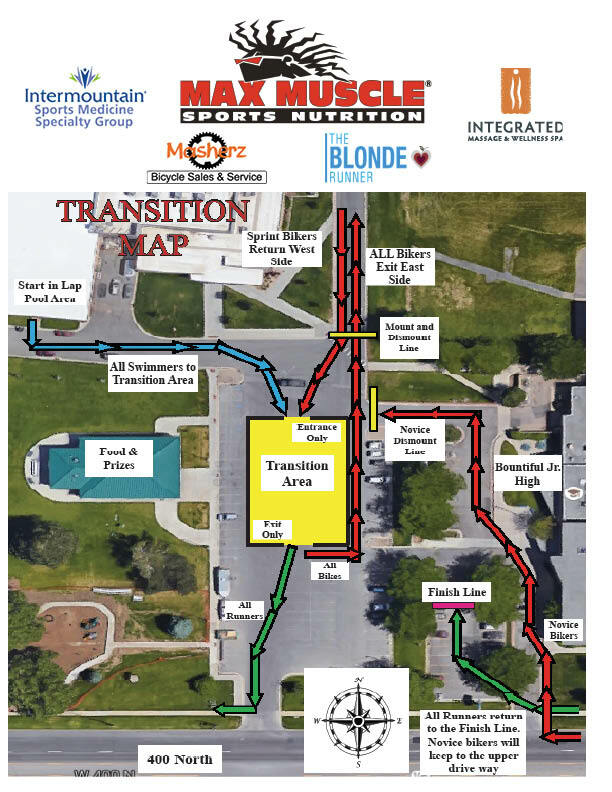 Packets are available for pick up on Saturday May 11, 2019 (the morning of the race) from 5:30-7:00 AM in the Bountiful Junior High gym (attached to the SDRC building), located at 550 North 200 West, Bountiful, Utah 84010. Parking is allowed in our facility parking lot. 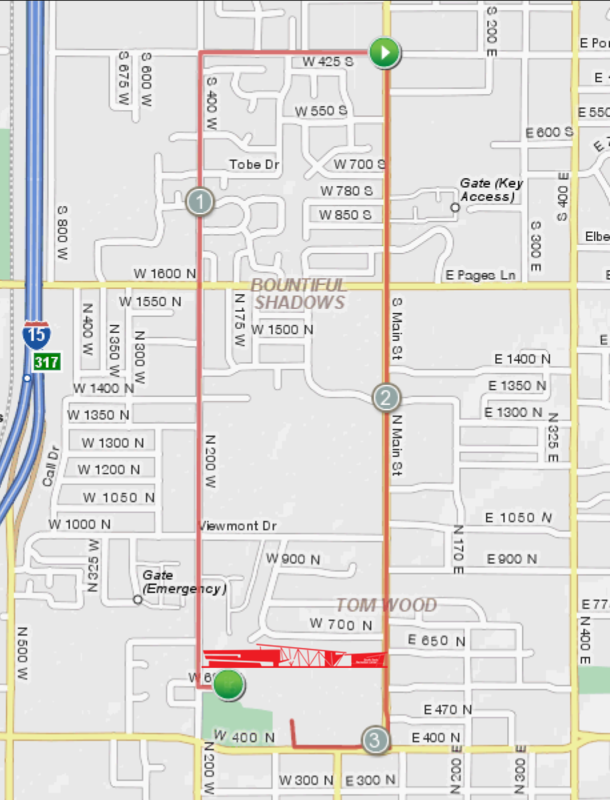 We encourage parking in nearby neighboring roads, or Meadowbrook Elementary (695 North 325 West, Bountiful, Utah). This course involves a sprint triathlon distance as well as a novice distance. Our triathlon is in TRUE triathlon order: swim, bike, run. 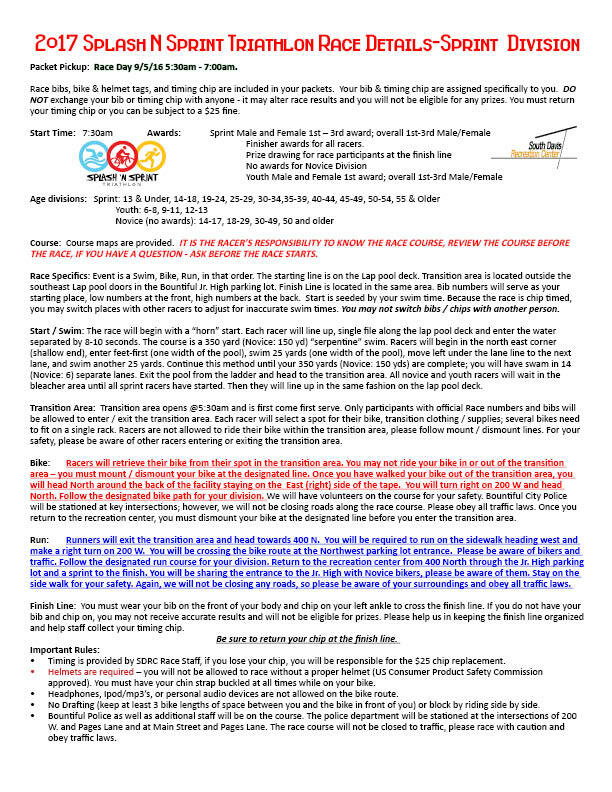 Click here for a PDF of all race details. The transition area will open at 5:30am. All racers, both Sprint & Novice, will be in the same transition area. It is a first come, first serve transition area. We plan on 8-10 bikes per bike rack, so don’t plan on having much space! With over 550 racers, those bike racks will be full. For better balance and best spacing, place your bike in the opposite direction as the bike next to yours. We do also bring in a kids bike rack so that kids can have better access to their bikes when ready to head out on the bike route. This rack will be located in the south-east corner of the transition area. There is an archway labeled, “TRANSITION IN” and one labeled, “TRANSITION OUT”. Anytime you are going INTO the transition area from an event, you’ll go in the IN archway, anytime you go out to the next event, you’ll head out the OUT archway. Please pay attention and be aware that if you are going the wrong direction, you will likely cause problems with your time! The swim of the sprint distance will be held in the lap pool (competition pool). The race will start at 7:30am. We ask you to head down to the pool area at 7:15am. Don’t forget any of your swim stuff (goggles, cap, anything else you need!). Novice racers, you’ll need to head to the pool area; however, you will wait in the stands until all sprint racers have started. Once you are out of the transition area, you cannot go back in! We will be turning on our transition timing points so we are ready for the first racer to come out. If you re-enter the transition area, it could cause problems with your race time! When you are lining up at the pool, you can line up by your bib number; smallest in the front and larger as you get to back. You were assigned your bib number according to the seed time you entered when you registered. Don’t worry; you aren’t required to enter the water in that order. Perhaps you trained better than you planned, or sadly – didn’t get enough training in; causing your time to be different than what you entered at registration. Once you are lining up, you can move around according to the signs we have on the walls and according to other racers near you. Talk to others around you to see what times they’re planning on and move to where you feel comfortable. You’re time won’t start until you actually get in the water and will end when you go into the transition area, so start where you’re comfortable! Do all the racers a favor and start where you will fit well with your ability! For the sprint distance, you will swim 350 yards – 14 lengths in the pool. You will swim one length, then under a lane line and back, then under a lane line again and so on. The last lane will be a double wide lane, when you get the east-side, you can hop out of the pool anywhere or using the stairs. From that point, head out the doors and up to the transition area where you placed your bike and equipment. The swim of the novice distance will be held in the lap pool (competition pool). The novice racers will start AFTER all the sprint racers have started. We ask you to head down to the pool area at 7:45am. Don’t forget any of your swim stuff (goggles, cap, anything else you need!). You’ll need to head to the pool area; however, you will wait in the stands until all the sprint racers have begun. The novice race will start about 8:45am. Remember, once you are out of the transition area, you cannot go back in! We will be turning on our transition timing points so we are ready for the first racer to come out. If you re-enter the transition area, it could cause problems with your race time! When it’s your turn to line up at the pool, you can line up by your bib number; smallest in the front and larger as you get to back. You were assigned your bib number according to the seed time you entered when you registered. Don’t worry, you aren’t required to enter the water in that order. Perhaps you trained better than you planned, or sadly – didn’t get enough training in; causing your time to be different than what you entered at registration. Once you are lining up, you can move around according to the signs we have on the walls and according to other racers near you. Talk to others around you to see what times they’re planning on and move to where you feel comfortable. For the novice distance, you will swim 150 yards – 6 lengths in the pool. You will swim one length, then under a lane line and back, then under a lane line again and so on. The last lane will have an orange cone in front of it, when you get to it, on the east-side, you can hop out of the pool anywhere or using the stairs. From that point, head out the doors and up to the transition area where you placed your bike and equipment. One of the first things you have to remember for the next portion of your race is that you need to remember your helmet! We won’t let you out on the course without one. You’ll need to stay off your bike until you are out of the transition area. There will be a mount line just outside the transition area where you will be able to get onto your bike (at any point after the line) and head out onto the course. You’ll make a right hand turn onto 400 North right when you get out of the parking lot. This year the sprint distance for the bike is an out and back course. View the PDF (link below) to see the bike map, and instructions. As you continue on the course, please remember that we do not close ANY part of the course. 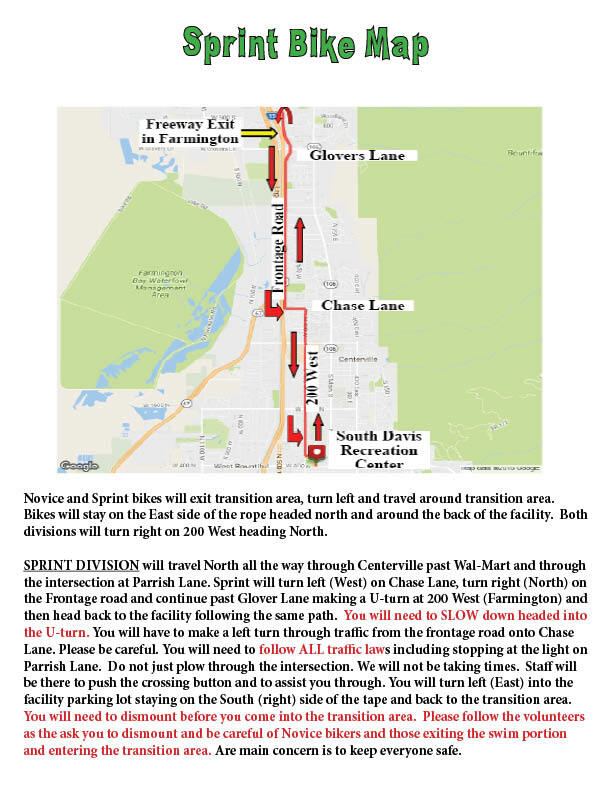 It is open to traffic and we EXPECT all racers to follow all traffic laws. This would include stopping at stop lights, stopping for trains, and SLOWING down and stopping if necessary for stop signs. We have volunteers and police officers on the course for your safety; but first and foremost, you as a racer need to be familiar with the course. We offer maps for download and hope you take the time to study them and be familiar with where you are going. One of the first things you have to remember for the next portion of your race is that you need to remember your helmet! We won’t let you out on the course without one. You’ll need to stay off your bike (walk it) until you are out of the transition area. There will be a mount line just outside the transition area where you will be able to get onto your bike (at any point after the line) and head out onto the course. You’ll make a right hand turn onto 400 North right when you get out of the parking lot. As a novice racer, you’ll just need to remember it’s ALL RIGHT TURNS! As you continue on the course, please remember that we do not close ANY part of the course. It is open to traffic and we EXPECT all racers to follow all traffic laws. This would include stopping at stop lights, and SLOWING down and stopping if necessary for stop signs. We have volunteers and police officers on the course for your safety; but first and foremost, you as a racer need to be familiar with the course. We offer maps for download and hope you take the time to study them and be familiar with where you are going. The last important part to the novice course is that you will make a right hand turn into the front of Bountiful Junior High. You’ll bike across the front drive of the junior high and turn into the “TRANSITION IN” archway. Don’t miss this! We can’t adjust times or anything due to wrong turns taken! The run course of this race is a pretty easy one! All right turns! Remember when you head out of the transition area, (see map), you’ll head down a sectioned off area next to the transition area. You’ll then be crossing a large open area towards the back road of our facility. You’ll head all the way through our parking lot (north side) and out to 200 West. Again, the course is not closed at any point. Please follow all traffic laws for your safety! There will be an aid station half way through the course on Porter Lane & Main Street where volunteers will have water, an electrolyte drink and first aid if needed. The run course of this race is a pretty easy one! All right turns here too! Remember when you head out of the transition area, (see map), you’ll head down a sectioned off area next to the transition area. You’ll then be crossing a large open area towards the back road of our facility. You’ll head all the way through our parking lot (north side) and out to 200 West. Again, the course is not closed at any point. Please follow all traffic laws for your safety! Awards will be given to the top 3 overall male/female as well as the top 3 in each age division in the Sprint Distance. The Youth Division will be given awards for the 1st place Male/Female in the age divisions only. For the Novice Division, no awards will be given. A: Registration for our Splash-n-Spring triathlon closes on Thursday May 9, at 11:59 PM. We do offer race day registration, which is available at packet pick-up times ONLY! Keep in mind prices do increase as the race gets closer – don’t procrastinate! The last few years, these have been sold-out races, so race day registration is not guaranteed. Q: When is packet pick-up? Q: Can I still pick up my packet (and shirt!) if I choose not to race? A: Yes! It will be available for you to pick up for 1 week after the race. After that, it will no longer be available for pick up. A: Something to RUN in! We won’t cancel our race: rain or shine! Dress for the weather! The last couple years we’ve had both rain and sunshine. Check the weather and be prepared for anything! Q: How early do I need to be here on race day? A: Since you are picking up your packet on race day, come EARLY! Plan for lines, we usually have about 550 racers participate in this race. The shortest lines are at the beginning of packet pick-up which opens at 5:30 am on race day. A: Our facility parking lot (550 N 200 W, Bountiful, Utah) is where the majority of racers will park. The parking lot on 400 N in the back of our facility will be closed as the finish area for racers. Meadowbrook Elementary is our offsite parking, it is located at 700 N 325 W, Bountiful, Utah 84010. Street parking is allowed in most areas nearby the facility as well. Q: Can I change race distances? A: Yes. This can be done on active.com before the race or in person for a $5.00 fee. If you are increasing distance, you will also be charged the difference in race cost in addition to the $5.00 fee. If you choose to change on race day, there will be a difference in race cost if you’re increasing distance. Q: Can I exchange my shirt size if it’s the wrong size? A: Unfortunately we order based on what you selected when you registered. We cannot exchange your shirt size. Q: What kind of shirt will I get? A: We provide a long sleeve tech shirt! It is gender specific and is one reason people like our race! So you know, they do tend to run a little small, so ladies… if you’re unsure, go one size up. Q: What are the awards? Q: What if I leave before the award ceremony and I’ve placed in overall or age division awards? A: We will hold your award at the front desk of our facility for 1 week and you’re welcome to come and pick it up. After that point, it will be unavailable for pick up. Q: Are results posted? When and where? A: We post live results to: www.itsyourrace.com . They are preliminary live. We work through a couple glitches and have final results posted within 24 hours to the same site (www.itsyourrace.com) as well as the race website (www.southdavisraces.com), the facility website (www.southdavisrecreation.com), and our race series Facebook page (www.facebook.com/southdavisraces) . Phew. We’ve got a lot of sites to post to. Q: Can I switch my entry to a friend or family member if I’m injured? A: Sure! This will also be subject to a $5.00 fee. You’ll need to contact us at races@southdavisrecreation.com at least 48 hours in advance of race day! Q: Can I get a refund if I change my plans or I’m injured? A: Sorry! No refunds on race registrations! Q: Can man’s best friend (aka my dog or pet) run with me? A: Sorry. Not for the triathlons. Q: Can I run with a stroller? A: Sorry. Not for our triathlons. Q: Is this race timed? A: Yes! We provide chip timing at all transition points and the finish line. The chip will be attached to an anklet that you will receive in your packet at packet pick-up. You must wear your anklet correctly and an assigned bib on the front of your body on the outermost layer of clothing for accurate results. If you are wearing your bib incorrectly, you may not be eligible for awards. The South Davis Race Series is hosted by the South Davis Recreation District. Each race is staffed by employees and volunteers from the Recreation Center, family members of racers, and members of the South Davis community. Due to the cost of hosting such an event, we want all of our volunteers and sponsors to know how grateful we are to your commitment to these races. We could not do these races without you.